16 1/4 in. (41.3 cm.) diam. 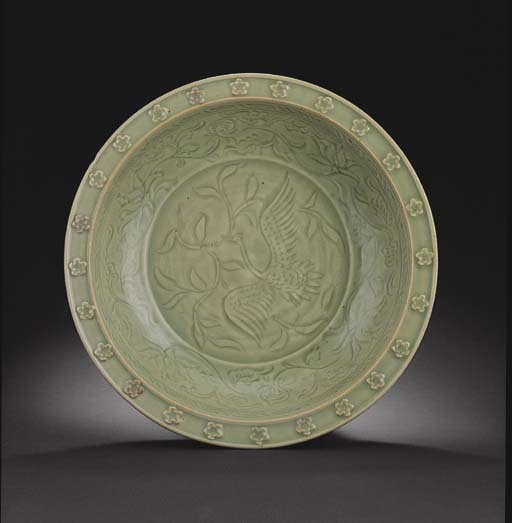 Many Longquan celadon wares from the Yuan dynasty reflect the spirit of experimentation during this period. On the present dish, the florets on the rim are individually sprig-moulded and applied to the clay body of the dish before glazing. In some instances, the sprig-moulded elements were applied on top of the glaze before firing so that the individual appliqués biscuit-fired to an orange colour, contrasting with the green of the glaze. No other dish of this design appears to be published. The closest comparison is a dish from the Topkapi Saray Museum, carved with twin-fish on the centre, lotus scrolls around the cavetto and decorated with biscuit florets on the flattened rim, illustrated by R. Krahl and J. Ayers, Chinese Ceramics in the Topkapi Saray Museum, Vol. I, no. 110 and on the cover. Cf. also the dragon dish, also from the Yuan dynasty, illustrated by R. E. Scott, Percival David Foundation of Chinese Art, A Guide to the Collection, London, 1989, fig. 49.